Among the narrow streets of old Milan, behind the Cattolica University’s main building, is this part of an almost forgotten town. In spring every flower with colored petals paints an unexpected and idyllic garden. A frame of columns poorly restored encloses this space, as protected by the statues that overlook between one arch and another. I tried to find some valid historical information about the origins of what looks like an old abandoned house, and just two theories could be true. 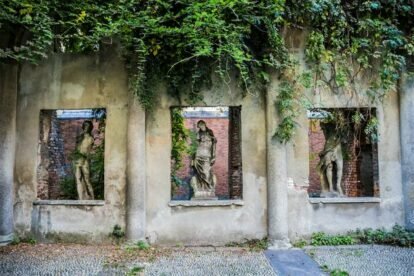 One says that the gardens were part of the residence of the humanist Bernardino Corio, who lived between the late 1400s and early ‘500 and was really close to the Sforza family. Another theory states that it could be related to Bramante. For sure, right here must have been the site of the first home of the ‘Catholic University, in Sant’ Agnese. But a bit of mystery only adds charm to a piece of green and classicism, dedicated to the Greek scholar Aristide Calderini. A plaque commemorates Francesco Castellini, a boy who loved this quiet corner of the city.